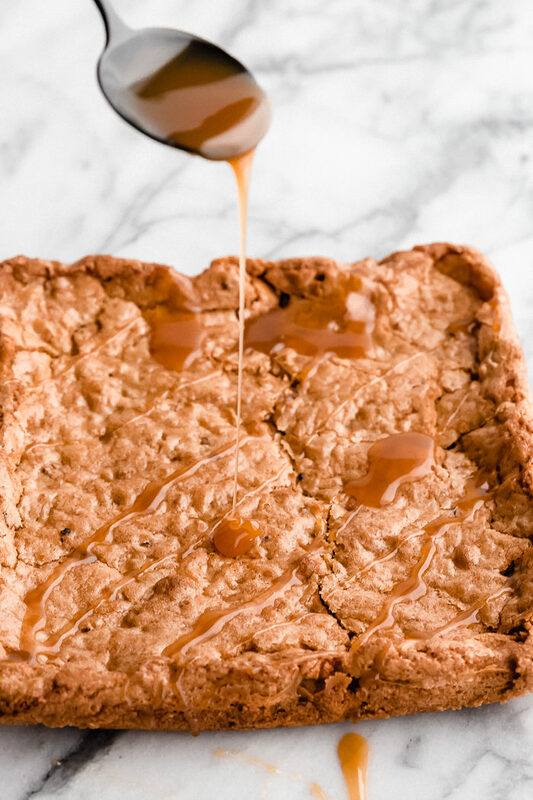 Butterscotch Blondies are the perfect rich and chewy treat loaded with butterscotch morsels and topped with gooey butterscotch topping. They are a delicious treat and each and every bite is irresistible! 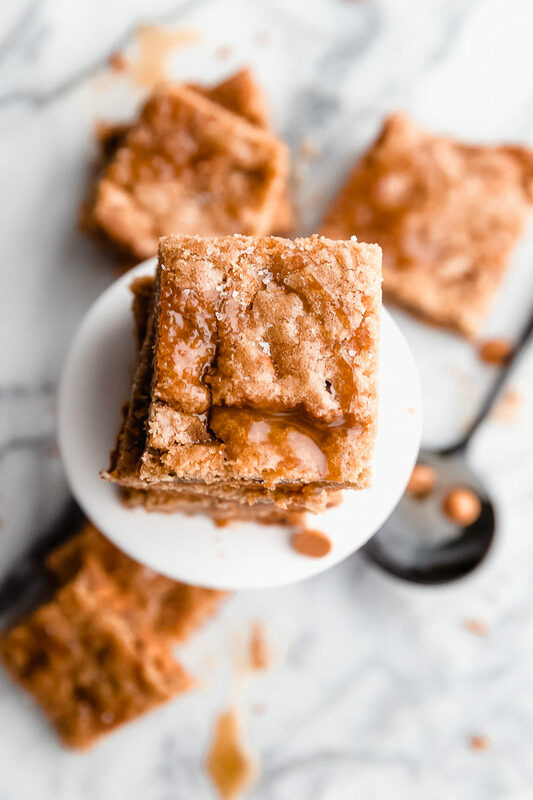 If you have ever made blondies then you know how gooey and amazing they are, but these butterscotch blondies are the ultimate chewy goodness that will melt in your mouth. This blondie recipe is quick and easy to whip up. The hardest part is waiting for them to be done! The aroma that comes from your oven as these bake will have anyone and everyone in your house lining up to get the first bite. Brownies and blondies look very similar, but the biggest difference is in the taste. A brownie’s base is made with cocoa giving them more of a chocolate brownie flavor. A blondie’s base is made with brown sugar which gives them more of a rich caramel or butterscotch taste. 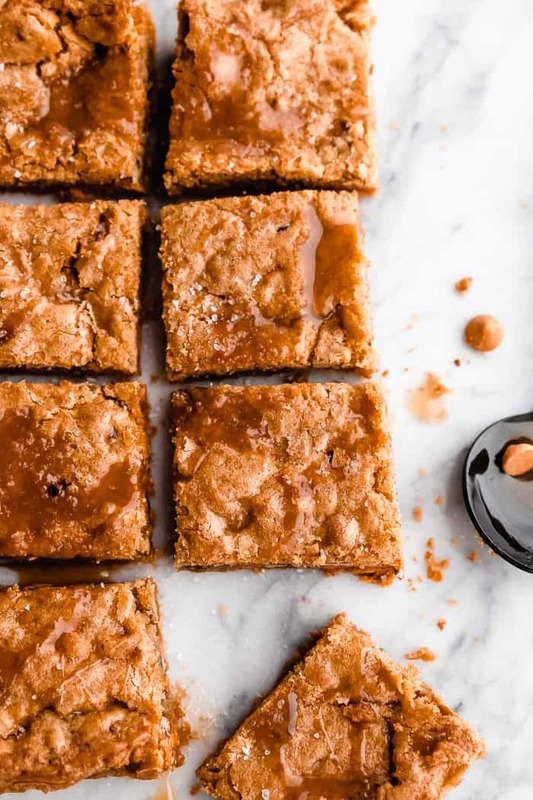 This Butterscotch Blondie recipe adds butterscotch topping and a sprinkle of sea salt to already warm and decadent blondies. It really seals the deal when you are looking for the ultimate sweet dessert treat! If your family is a fan of gooey desserts you will also love these Triple Chip Caramel Brownies, Chocolate Dipped Peppermint Brownies, or Brookies Bars! All are perfect to satisfy any sweet tooth. Preheat the oven to 350˚F. 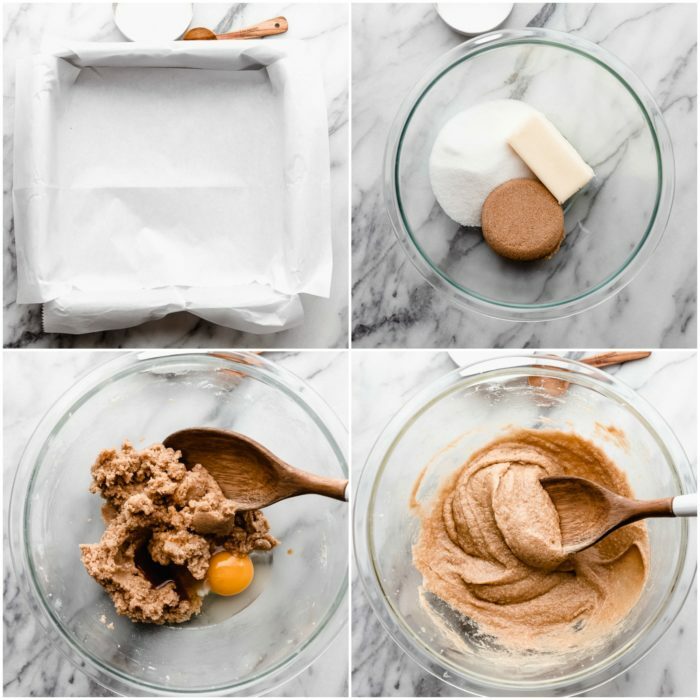 Line a 9×9 or 8×8 baking pan with parchment paper and set aside. In a large bowl mix together butter, sugar, and brown sugar. Add in egg and vanilla and continue mixing until combined. Add in flour and baking soda and mix to combine. Fold in butterscotch chips and chopped pecans until incorporated. 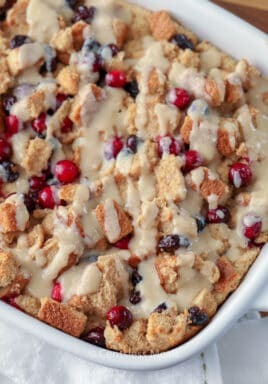 Place batter into prepared baking dish and bake for 33 minutes. Allow butterscotch blondies to cool in pan for about 10 minutes, then remove by lifting up on parchment paper and allow to cool another 10 minutes. 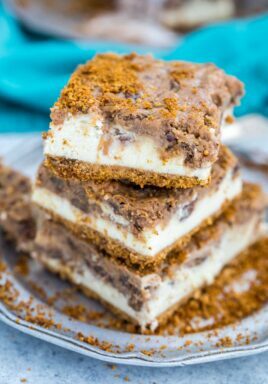 Drizzle the top with butterscotch topping and sea salt flakes. Cut into squares and serve. Once they are cut into squares and have cooled completely you can store them in an airtight container. Line the container with parchment paper so they don’t stick. Blondies can be kept in the refrigerator for up to a week, or at room temperature for about 3 days. 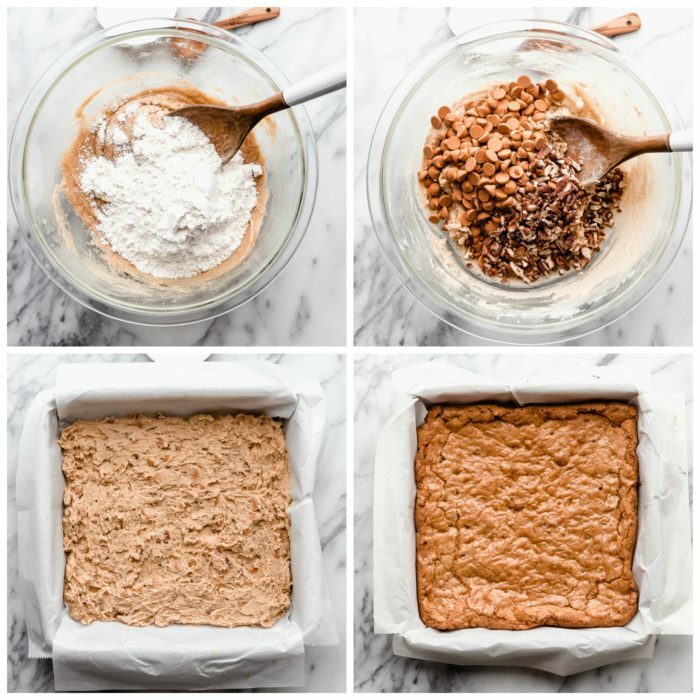 This blondie recipe is so versatile! If you don’t want to add the pecans or you would prefer to add in something else you can. They are easy to make and will taste amazing with the addition of chocolate chips, cashews, toffee pieces or whatever your heart desires. Yes! Blondies can be placed in the freezer for to 2-3 months. Allow the blondies to cool completely before placing them into an airtight container. 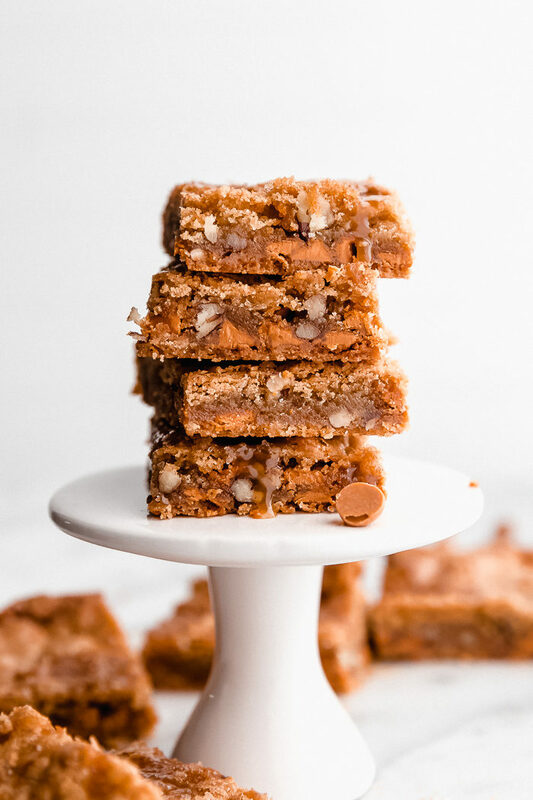 Blondies are one of my favorite desserts and this is the best blondies recipe! 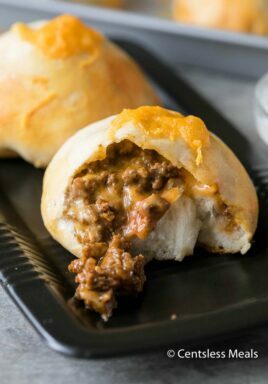 It is so effortless and delicious you will fall in love with them as soon as they begin to bake in the oven. All you need is one bowl and one pan and that’s it! Clean up is simple and will be worth every chewy, gooey bite! 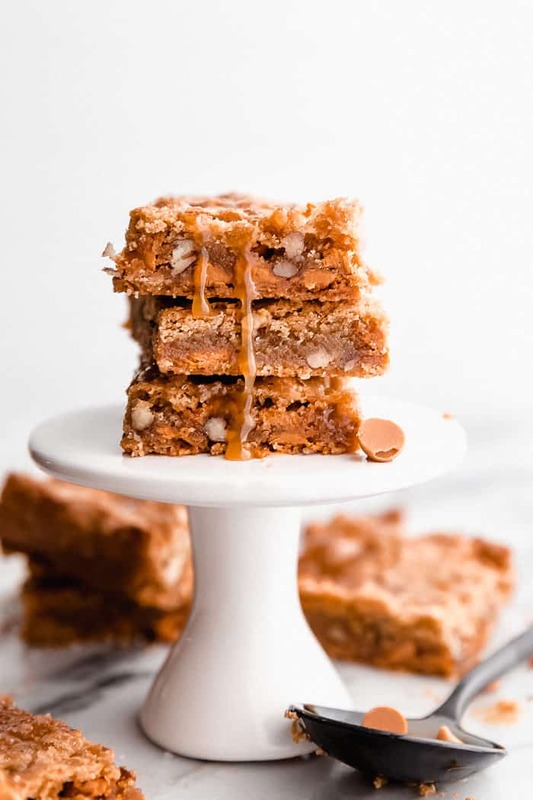 Butterscotch Blondies are the perfect rich and chewy treat loaded with butterscotch morsels and topped with gooey butterscotch topping. They are a delicious treat your family will love! Preheat the oven to 350˚F. Line a 9x9 or 8x8 baking pan with parchment paper and set aside. In a large bowl mix together butter, sugar, and brown sugar. Add in egg and vanilla and continue mixing until combined. Add in flour and baking powder and mix to combine. Fold in butterscotch chips and chopped pecans until incorporated. Place batter into prepared baking dish and bake for 33 minutes.